The high concentration of prehistoric rock carvings is the main attraction at Petroglyph Provincial Park, located at the south end of Nanaimo. Visitors can get a glimpse back to a time more than 1,000 years ago, when First Nations peoples created these traditional carvings. This day-use park offers excellent viewing opportunities of these petroglyphs. Locations for rock art carvings were chosen carefully, and were almost always made at places of power or mystery – places where the forces of nature were believed to be especially strong. These areas are usually marked by natural features such as waterfalls, rock formations or caves, and most are near water. A short walkway leads from the parking lot to an interpretive area with information boards that offer details about the history of the area and help to decipher the petroglyphs. The images – depicting everything from mystical wolf-like creatures to fish and human figures – were made for a variety of reasons, including territorial ownership and to commemorate special events among a people with no written language. The sandstone gallery of petroglyphs, located on a hill overlooking Nanaimo Harbour, is just a short distance from the interpretive area along the walkway. Concrete replica castings of the petroglyphs can be found in the main interpretation area. Here, visitors can make rubbings of the castings by stretching cloth or paper across the carving and lightly rubbing with a crayon, charcoal or wax, which leaves a reverse imprint. These rubbings make a great souvenir of a visit to this intriguing and educational park. Please stay on designated trails to protect the petroglyphs and vegetation. Petroglyph Provincial Park is located just south of Nanaimo on southern Vancouver Island. Access to the park is via a pulloff from Hwy 1. Watch for signs. Conservation: The high concentration of prehistoric rock carvings is the main attraction at Petroglyph Provincial Park, which was established in 1948 to protect the petroglyphs for future generations. Visitors can get a glimpse back to a time more than 1,000 years ago, when First Nations peoples created these traditional carvings. Locations for rock art carvings were chosen carefully, and were almost always made at places of power or mystery – places where the forces of nature were believed to be especially strong. These areas are usually marked by natural features such as waterfalls, rock formations or caves, and most are near water. The carving – depicting everything from mystical wolf-like creatures to fish and human figures – were made for a variety of reasons, including territorial ownership and to commemorate special events among a people with no written language. The approved Purpose Statement and Zoning Plan is available in pdf format. A short trail leads from the parking lot to the interpretation area. The high concentration of prehistoric rock carvings are the main attraction at Petroglyph Provincial Park. Visitors can get a glimpse back to a time more than 1,000 years ago, when First Nations peoples created these traditional carvings. This park offers excellent viewing opportunities of these petroglyphs. The images – depicting everything from mystical wolf-like creatures to fish and human figures - were made for a variety of reasons, including territorial ownership and to commemorate special events among a people with no written language. 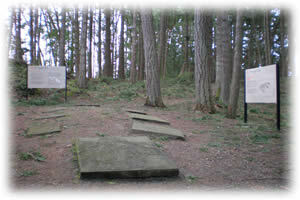 The sandstone gallery of petroglyphs, located on a hill overlooking Nanaimo Harbour, is just a short distance from the interpretive area along the walkway.